Cross Academy is an elite boarding school with two separate, isolated classes: the Day Class and the Night Class. 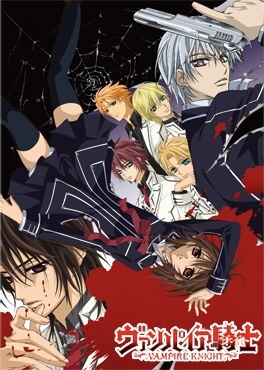 On the surface, Yuuki Cross and Zero Kiryuu are prefects of the academy, and attempt to keep order between the students as classes rotate in the evenings. As the night class is full of utterly gorgeous elites, this can sometimes prove to be a bit difficult. It is completely necessary, however, as those “elites” are actually vampires. Yuuki and Zero act as guardians, protecting the secrets of the Night Class and the safety of the ignorant day class. As the adopted daughter of the academy’s chairman, Yuuki takes her job with a serious and energetic attitude. It also allows her to interact with her secret crush and savior, the night class’ dorm president, Kaname Kuran. Zero, on the other hand, has a deep-rooted hatred against vampires, and at times, does not hesitate to kill. Can vampires and humans co-exist, even in the strict setup of the Cross Academy? Only time will tell.